“Nothing makes you more tolerant of a neighbour’s noisy party than being there.” Franklin P. Jones (American Businessman, 1887 – 1927): the perfect quote to introduce our own noisy party, to which, of course, we invited all our neighbours and friends. It was a very English Guy Fawkes Party on Bonfire Night (5th November, although we slid ours into the nearest Saturday). 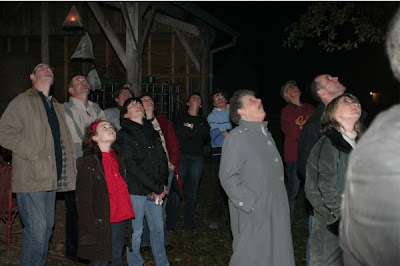 We’d held a similar event two years ago, which was a great success despite initial scepticism from our French guests that it was a wise thing to have an outdoors evening event in the middle of November. They’ve become more used to our English eccentricities over the intervening time. 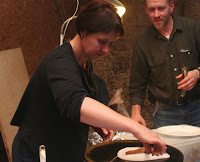 Having recently slaughtered two very large pigs, and with over 80 men, women and children to feed, probably the world’s best homemade sausages seemed the obvious choice. We served up over two hundred, either tucked into soft rolls made to order by our village boulanger (baker) Jacky, or wrapped up in a buckwheat pancake—called a galette—made, “au fur et à mesure” by our musical friend, Michèle. 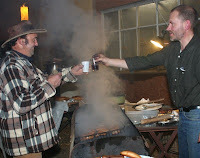 Having learnt a little more on how to host such an event, we successfully delegated a few tasks this time, so thanks to Caroline for serving the hot mulled wine all evening and to Sébastien and Serge for taking complete charge of the fireworks, apart from the sparklers, which were handed out by Michel and Gilles. It was a musical night as well, with Gabrielle’s and Alastair’s playing (violin and guitar, respectively) inspiring Julie, Maryté and Christian (two accordions and a clarinet) to join in. Thanks also to everyone who brought cakes to share for dessert. 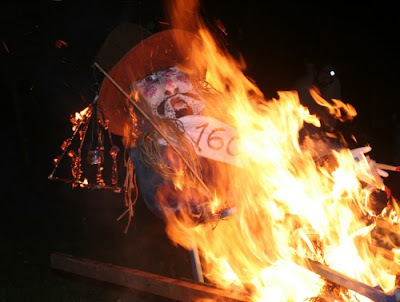 A very special mention has to go to Gabrielle’s wonderful “Guy”, a life-size mannequin fabricated from old clothes, straw, cardboard and papier maché, sat in a rickety deckchair who, following tradition, was burnt atop our bonfire after the sausages and before the fireworks (see photo at top).